I am lost in Port-au-Prince. This is the city where I was born, where I lived as a child, where I came back to live in my 20s, and where I have returned to visit a couple of dozen times since I started living abroad. But I am bewildered, suddenly not knowing where I am because nothing is recognizable. With the six-month anniversary of the earthquake looming, I had finally worked up the courage to visit Haiti. The journalist in me said that I had to see it for myself. But being lost is the last experience I expected. I feel as if I am in a war zone, with scenes that remind me of the images of Europe after World War II. In downtown Port-au-Prince, the commercial center of this sprawling city of 2 million people, block after block is marked by broken buildings, three-story concrete blocks tilted at precarious 45-degree angles; buildings collapsed vertically, with a second floor suddenly at street level and others just reduced to rubble in that terrible instant. There are still bodies under those piles, people tell me casually, but it may be years before they are recovered. The media have already chronicled the destructive moment of Jan. 12, when a magnitude-7.0 earthquake piled misery and 300,000 deaths on top of the misery that already defined life in Haiti, inevitably described as the poorest country in the Western Hemisphere. Haiti and its shortcomings have been dissected and analyzed in the media, with a full dose of regurgitation and recrimination due this week. This appraisal means something more when the subject is the land of your birth. To me, Haiti is far more than a set of dire statistics. There are memories at every intersection, experiences that took place in houses and churches and schools and backyards: dancing during carnival, spirited arguments over Barbancourt rum and lime, and fearful silences under dictatorship. Maybe because this visit is so disorienting, I find myself vividly remembering scenes from my childhood: The brown prickly-cheeked uncles from Léogane in their white linen suits, who smelled of tobacco and aftershave, bearing jars of vanilla extract, honeycombs and peaches marinated in rum. The Sunday Mass at Saint-Pierre and the lovely formal plaza in front of the church, where we bought hard candy for pennies before going to the Sunday movie, a Roy Rogers film or an adventure story like Scaramouche — preceded, of course, by two cliffhanger episodes of Captain Marvel or Commando Cody. Now the plaza is covered with blue tarps and tents, and I see people taking showers in open stalls. The home that my mother loved in the hillside suburb of Bourdon — the sprawling, vaguely Spanish house with the red roof tiles, stone arches and wrought-iron bars on the windows — was also flattened by the earthquake; its stones and tiles have been scavenged by the squatters who have already built a shantytown on its grounds, as the homeless have done on every square inch of open space in the city. I swing by the campus of Saint Louis de Gonzague, the 120-year-old school that my father and his brothers attended before me, several of its elegant end-of-19th-century buildings collapsed, the roofs caved in, the priceless collection of historical documents in peril. I still get that frisson as I remember Frère Clair, the stern disciplinarian who ruled over my first-grade class, armed with a four-sided rod that he'd rap on the desk for attention, or on your fingers if he found ink on them at the end of the school day — an inevitability, it seemed to this 6-year-old, who had to dip a stiff steel pen into an inkwell. His special authority came from my knowing that, decades earlier, he had also put the fear of God and his ruler into my father and his three brothers. I've never been sentimental about Haiti. I knew that my own family of affluent, socially conscious professionals had a privileged life there, as well as the ability to leave and make a new life elsewhere, while millions lived at subsistence poverty levels. After studying in the U.S. on scholarship, my father tried to propagate vocational education in Haiti but gave up when confronted by corruption. He took his skills (and his family) to Africa and Europe and finally New York during the darkest days of the Duvalier dictatorship. 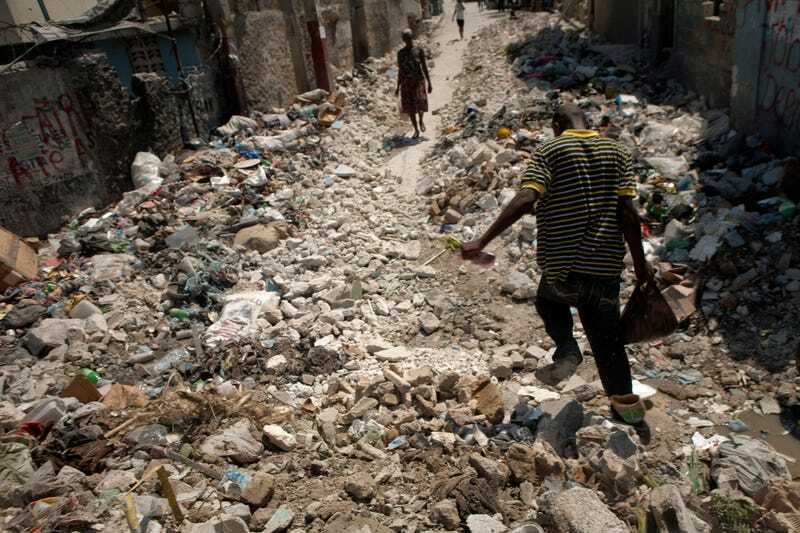 I can remember a more pristine Port-au-Prince, a city of 200,000 in my childhood. I haven't confused memory and nostalgia: Documentaries and a strange film about voodoo from the 1950s show an uncrowded Port-au-Prince, relatively clean streets and few cars. Traffic jams were unknown, and there was not the choking pollution of today, when a trip across the city can take an hour or more. Many of the problems that existed even before the earthquake stem from the population explosion and centralization of power under the Duvaliers. Although there was little improvement in the infrastructure, the city's population grew 10 times larger than it was designed for, spawning vast, unregulated shantytowns, many of which were destroyed in the earthquake. The chaos has triggered a dangerous nostalgia for the past. People remember the order, but not the fear, from the years of dictatorship. But I saw the tail end of that regime when I went back in 1975 and Baby Doc was doing a fair imitation of his father's iron rule. I was on leave from the Washington Post, and the dictatorship kept a close eye on me. All my mail was opened, clumsily resealed and stamped "received in this state." When my wife's sister arrived from the U.S. and no one met her flight, the tontons macoutes, the Duvalier militiamen and secret police who controlled the airport, told her: "We know where he lives," and delivered her directly to my door. And I also saw how the political oppression stifled creative thinking. In 1975 I attended the discussion of a controversial book about plans for the development of Haiti. The room at the Alliance Française on Port-au-Prince waterfront was jammed with young Haitians eager to discuss the future of their country. Several officials from the Duvalier government sat sternly in the first row, menacing in their suits and dark glasses. The author gave a scholarly presentation of his book, ticking off why so much foreign aid had failed in the past. Early on during the questioning, one young man put up his hand and asked, "How can you talk about development without talking about the role of the government?" The author looked down at the unsmiling officials in the audience and said, "You know we can't talk about that." A pall went through the room. People got up and the room quickly emptied. They knew there would be no more meaningful discussion. The president meets daily with representatives of an estimated 10,000 non-governmental organizations (charities, rescue organizations, missionaries and so on) that operate in Haiti. But after 30 years of effort in the nation, there is little progress to show for it. The NGOs are uncoordinated and have their own agendas, and some don't even bother to register with the government. Often, their arrogance is a turnoff. A group of Haitians I know operate a community hospital that was undamaged in the earthquake. They served 600 patients a day nonstop for weeks after the earthquake, scavenging what medical supplies they could and dependent on donations from the U.S. When a group of foreigners showed up from a famous European medical charity, the Haitians welcomed them and offered them space to operate. The Europeans told the Haitians that they had their own team and the Haitians should clear out and turn the hospital over to them. The Haitians declined, and continued to provide the best care they could. The earthquake has exposed the fragility of Haiti's government and the fault lines in Haitian society. Many Haitians worry that little will change in the coming years, that the promised billions will disappear into the pockets of the rich and powerful who want to keep things as they are. But this is also a last chance for Haiti. Keeping things as they are is no longer an option. The question is whether enough Haitians will rise out of their self-interest; tap the vast stream of Haitians who have experienced success in America, Canada and Europe; and make use of the good will and commitment that the global community has shown to build something even better than my memories. Joel Dreyfuss is managing editor of The Root. Follow him on Twitter.